River Cottage has become synonymous with a life revolving around good food, either grown in a sustainable way at home or sourced responsibly with a proper understanding of the people and land that produce it. The theme for this year is the team at River Cottage HQ, and the 12 months will be based on 12 different seasonal activities that go on there. We start the year building a bread oven with Daniel Stevens, author of Bread, and end it with Hugh’s famous multi-bird roast for Christmas. In between there is bee-keeping, fishing and herb-foraging in the Devonshire countryside, among other fun activities. 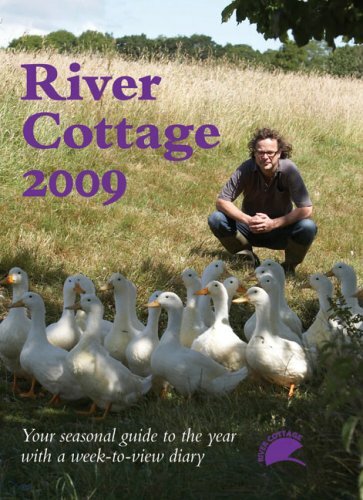 It was 1998 when Hugh moved into the original River Cottage in Dorset, to start growing and rearing some of his own food. ‘River Cottage’ has since moved on, and has grown and developed, but we continue to stand for the same principles: self-sufficiency, food integrity, and the consumption of local, seasonal produce. River Cottage HQ (Park Farm) is our base for running courses and events inspired by the philosophy of the original River Cottage – ranging from a night’s dining and entertainment, through to courses in foraging, curing, gardening, breadmaking, butchery and more. For full details, see the River Cottage HQ Events and Courses homepage and meet the River Cottage Team. River Cottage also has a Local Produce Store in Axminster, where we work with a wonderful collection of local and organic food & drink producers from the South West. We stock a wide selection of the very best local and seasonal provisions including milk, eggs, bread, meat, poultry, beers and wines. The Axminster Canteen annexed to the Local Produce Store serves meals during the day and is open for evening service and Sunday lunch. We have also teamed up with our friends at Komedia to bring River Cottage to Bath. The Bath Canteen is open every day and like the Axminster Canteen, showcases the very best of what the South West has to offer. Our other projects include series for television, regular food columns, and a range of books, DVDs and online courses, some of which you may already be familiar with. To keep up-to-date with our latest news, bookmark our News homepage, or sign up for our monthly newsletter. River Cottage is not a charity, but does aim to be a ‘more than profit’ organisation. This means, firstly, that we are ready to re-invest much of our income in developing our ideology and the base of our activities.